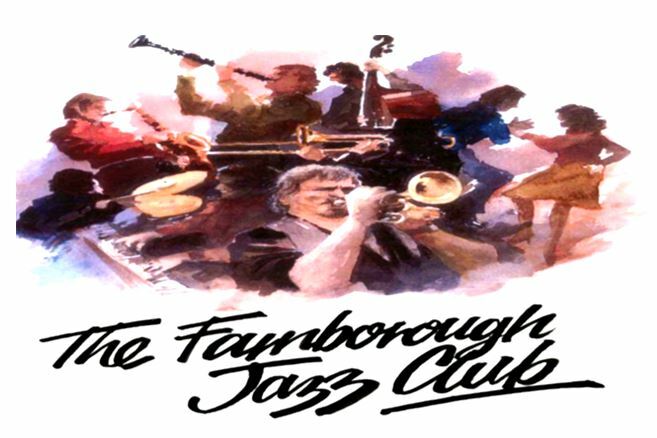 MIKE BARRY’S UPTOWN GANG entertained us on Friday, 29th November 2013 here at Farnborough Jazz Club and brilliantly too. The musicians were (leader) MIKE on trumpet, JOHNNY ROGERS on reeds, ‘WHISPERING’ MIKE HOLT on trombone and vocals, JOHN STUART on banjo and guitar, ROGER CURPHEY on string bass and GRAHAM COLLICOTT on drums. Last week, I asked for everyone to make it another humdinger evening and that you all did. Again, there was plenty of dancing with this happy band. I didn’t mention on the mike, but must say now. Before our audience arrive and after the band were all set up, all I heard from the band were peals of laughter. Nice to hear the band enjoying themselves before they started. The first number they played was ‘Zing Went the Strings of my Heart’ (although Mike called it ‘………. Strings of my Vest’. Yes, a lovely number with dancers on the floor straight away. This was followed with another great dancing number called ‘Everybody Loves My Baby’, with great solos from everyone. Their next number was ‘Oh Baby’, which brought out our line-dancers. Drummer Graham left his drums and joined us in the dance, to everyone’s amusement. Now the next number was sung by Johnnie (R). It was called ‘As Long as I Live’ (a number played for the last show at the famous Cotton Club Parade), well done Johnny. Kid Ory’s number called ‘Creole Love Call’ followed, (a mambo I think which I just love). Again fabulous solos from all. Then ‘Harlem Folk Dance’ was another brilliant number – I put a huge asterisk against it. Then ‘Whispering’ Mike sang the next tune ‘You Brought a New Kind of Love to Me’. Don’t you just love his humour? Another fab number was ‘Johnson Rag’, a lovely dance beat and would you believe it, lyrics updated by Jack Lawrence in 1940 (the lyricist I talked about two weeks ago in newsletter for the Muskrat Ramblers, 15th November). Johnny (R) had a special feature next with ‘Wild Cat Blues’ (of both Sidney Bechet and Monty Sunshine fame). What a lovely player Johnny is and he sang too. It is hard to choose the next numbers played, I really don’t want to give too many numbers, as it is not fair on the band to mention all their repertoire, but I will tell you of the next two. My Keith took over drums (whilst I danced with Graham). It took a bit of coaxing to get Keith on the drums, because you might recall, he fell down the stairs at home a few months ago, broke his ankle, so he wasn’t sure he would be able to play. However, with his old mates, Roger and John (S) in the band, he felt a little easier, but as you guessed, he was (well I think) terrific. The two numbers he played with the band were that marvellous number ‘At the Jazz Band Ball’, followed by ‘Am I Blue’. I think ‘Whispering’ was singing! There you go, another super evening, with everyone leaving the club on ‘a high’. This entry was posted in Mike Barry's Uptown Gang on November 29, 2013 by Diane. ‘NEW ORLEANS HEAT’ returned to us again at the Farnborough Jazz Club on Friday, 22nd November 2013 A 7-piece band, with leader BARRY GRUMMETT on piano, GWYN LEWIS on trumpet, MIKE TAYLOR on trombone, JOHN SCANTLEBURY on reeds, TONY PEATMAN on banjo, COLIN BUSHALL on drums and HARRY SLATER on double bass. Barry travels from Loughborough, Glyn from Swansea, Mike from Sheffield, John from Cardiff, Tony from Lincoln, Colin from Gloucestershire and Harry from Long Eaton in Derbyshire, pretty amazing lot aren’t they. We had a good turn out for them, with a newish unexpected group of six ladies, plus another new group of four ladies. Of course that helps to make our male audience happy (better not say it makes the band happy, their wives may not like it – ha)! With a bigger audience, it was not easy to catch names of the tunes. I do know the dance floor was certainly very busy all the time, me too! I first jotted down ‘Salute to Ohio Blues’. Then ‘Oh Lady Be Good’, which was sung by John. Then a lovely dancing number I haven’t heard in a while, called ‘Ti-Pi-Tin’, wonderful. ‘Let Me Call You Sweetheart’ was next. Now you have guessed, plenty of singing from the audience, but lots of dancing too. ‘New Second Line (Jo Avery’s Piece)’ was one of those numbers you just know, but can’t recall its name – fabulously played. Then came Gordon’s request, called ‘All the Girls Go Crazy’ famously played by trumpeter William ‘Bunk’ Johnson. Then there was a special feature of Gwyn’s, accompanied by Tony. The number was ‘This Moonlite Power’. Gwyn also sang this so powerfully, he was terrific. My last number to mention is ‘Should I’, again marvellous. I then was so busy dancing, I failed to write down anymore – just enjoying every moment. I think all that were present would agree with me. ‘All the Girls Go Crazy about the Way I Walk’ – Kid Ory (1945) disputed earlier by Buddy Bolden (1944)? This entry was posted in New Orleans Heat on November 29, 2013 by Diane. ‘BILL PHELAN’S MUSKRAT RAMBLERS’ returned on Friday, 15th November 2013 at Farnborough Jazz Club. They played as a six-piece band, with leader BILL PHELAN on trumpet, what a lovely guy. The rest of the gang were ALAN CRESSWELL on reeds (Alan was with Max Collie Rhythm Aces for 18months), GRAHAM WISEMAN on trombone, CHRIS THOMSON on double bass, JOHNNY MCCALLUM on banjo (who was with Kenny Ball for 20years), plus PAUL NORMAN on drums. Of course, they began their repertoire with ‘Muskrat Ramble’, which was followed with ‘Beale Street Blues’. To begin with, our audience were all more talkative than usual, but I think the band felt a little mystified as to why it was only the usual four dancers for a bit. It was our first really cold Friday evening of the year, so I think they were all trying to warm themselves up. The band just kept playing their wonderful music. However, the audience soon relaxed and got up to dance and our real atmosphere blossomed. The next number I wish to mention is Alan’s feature song, namely ‘Petite Fleur’. How beautifully he played it too. Another great number was ‘Buona Sera’. Johnny sung this and certainly our dancers flooded the dance floor (I jotted down ‘lovely muted trombone from Graham’). ‘The Loveliest Night of the Year’ came next. This song was adapted for the film ‘The Great Caruso’ sung by Mario Lanza. Obviously, we all remember this song well, so we all sang it too. Bill asked us to take our partners for a waltz. Then the tempo stepped up to a quickstep. Lovely jubbly. They also played Buddy Bolden’s number called ‘Careless Love’. Then came ‘Ciribiribin’, a beautiful number and when it ended, I asked to speak on the mike. I told everyone that whilst doing my research, I came across the song writer (good looking too) called Jack Lawrence (www.jacklawrencesongwriter.com ). Aged 95yrs, Jack was still answering commenters. I am not in the habit of commenting on websites, but felt compelled to do so (was it his age, or his good looks!). Unfortunately I realised as I pressed ‘send’ that Jack had died two years earlier in 2009 (one month off his 97th). I quickly sent an apology in case of any upset to his family members. Back came a reply from a dear friend of Jack’s who said it had been like a time-warp. I am now in contact with this lovely lady – also called Diane. To continue … Bill himself, featured beautifully with the next Hoagy Carmichael number called ‘Stardust’. I remember Johnny played a wonder solo on guitar. It is such a fabulous number, with plenty of audience participation and at the end, they called out for ‘more’. It’s been a long time since that was called out (even if many wanted to do so on previous occasions, they haven’t!). Fats Waller’s ‘Black and Blue’ came next, then they ended the evening with ‘Creole Love Call’. Again, such a lovely evening and once again, due to the magic, I forgot to record. So sorry to tell you, we lost a dear friend, Graham, (friend of Stella and Doug). “Enjoy all those lovely musicians in the greater playing fields Graham”. I’m very sorry not to have let everyone know about Graham before now. Also, lovely Adrian Cox attended his funeral and I just want to say ‘Hi Adrian, glad to hear you look in at our website and well done for paying your respect to Graham’. This terrible storm in the Philippines is so very upsetting and have donated for myself. I am also asking you all, if you haven’t done so yourself, to bring a £1 or two and we will donate it to Red Cross from Farnborough Jazz Club. They need as much help as possible. We are all feeling the pinch, but they have been conducting themselves so gracefully, even in their terrible plight, but they are desperate now. We must help … please … thank you. This entry was posted in Bill Phelan's Muscrat Ramblers, Uncategorized on November 14, 2013 by Diane. BARRY PALSER’S SUPER SIX on 8th NOVEMBER 2013 certainly was (as I predicted last week) an exciting evening’s entertainment here at Farnborough Jazz Club. BARRY (trombonist) had booked ALAN GRESTY (trumpet), JOHN CROCKER (reeds), TONY PITT (banjo), HARVEY WESTON (double bass) and JOHN TYSON (drums). What a plethora of stars aye? Certainly not too much for me! I was so enjoying it, I forgot to do some filming. I suppose I’m not so perfect as I think I am, ha! Anyway, here’s how the evening went. They started their programme with Barry singing ‘When You’re Smiling’. This used to be a signature tune when Harvey played in the band years ago. Nice sentiment in the lyrics to kick off with. Next came a Bix Beiderbecke number called ‘Jass Me Blues’, which again brought on the dancers straight away and we certainly didn’t go away with the next number, ‘Nagasaki’ either, I think it was our line-dance number. John (C) was featured on tenor sax with ‘Honeysuckle Rose’, brilliant. Then Alan sang ‘Everybody Loves My Baby’ and I read somewhere that John (C) can, on occasions, be tempted to sing and he did just that, singing ‘All of Me’. John, you have a lovely jazz voice, so please be tempted to sing more often. They also played ‘Riverboat Shuffle’, a number written by Hoagy for Bix Beiderbecke. A slow happy little number called ‘Mama’s Gone, Goodbye’ came next, enticing dancers on to the floor. Now Barry often plays the last number, dedicating it to our Len, who started the song being called ‘Please Don’t Talk About Me, One Eye’s Gone’, a nice bit of humour against himself. There you go, we enjoyed the evening with friends and so sets us up for the rest of the week (good or bad). Thanks guys. This entry was posted in Barry Palser's Super Six on November 5, 2013 by Diane. ‘BOB DWYER’S BIX & PIECES’ played for us on Friday, 1st November 2013 here at our FARNBOROUGH JAZZ CLUB. Band members with trombonist BOB were MAX EMMONS on trumpet, BERNIE HOLDEN on clarinet, HUGH CROZIER on piano, JOHN BAYNE on double bass/bass sax, JOHN STUART on banjo, plus GRAHAM COLLICOTT on drums. Before I look at my notes, I must mention my favourite number of the evening! It was a song from Irvin Berlin’s film ‘Carefree’ staring Fred Astaire and Ginger Rogers’. You’ve guested it, ‘Change Partners and Dance with Me’. I remember there were plenty of dancers on the floor. I didn’t have a partner and I couldn’t help it, I found myself dancing around the outskirts of the dance floor and over to Keith at the bar, you know, how one does in your own home, when you are completely on your own! It was such a lovely old favourite song, one that you have to dance to (sorry folks, I’m such an ol’ romantic!). The other memory was of John Bayne playing bass sax, which I call ‘Big Bertha’ – anyone else refer to that instrument with this name? Maybe I got that name from someone else, I can’t remember! Well John, it has a wonderful rich sound and makes the hairs on my arms come up. Now back to my notes – ‘Piove (Ciano, Ciano Bambina)’, (translated ‘Chow, Chow Bambino’) was sung by Bob, with some audience participation, as one would expect. It was followed with ‘Minnie the Moocher’ and ‘Careless Love’. John (B) played big Bertha (bass sax) in both songs, fantastic. Then came a good old favourite ‘Hiawatha Rag’ and there was plenty of dancing going on. John (B) had a feature song with ‘China Boy’. What a splendid piece of playing from him, he is marvellous. Hugh sang the next one, ‘Puttin on the Ritz’ (from the musical of the same name). Would you believe it, Keith danced this one with me, he really can dance well, being a drummer (rhythm, legs, etc.). The next song featured Hugh on piano with ‘The Naked Dancers’ (also known as Hootchy-Kootchy Dance) and was introduced with such a story, because of the subject. We were asked if any of us ladies in the audience wanted to join in. Len offered our services, but Colin called out ‘No please, thank you very much’. Then Sandy (she’s such a sport) climbed up on a table and pretended to take part, much to everyone’s delight & laughter – well done Sandy. Hugh then sung his party piece ‘Caldonia’. He has a great voice and certainly can play those ivories. Well, once again a fun-filled happy evening of jazz. They certainly did keep smiles on our faces. ‘The Naked Dancers’ – Sol Bloom (1893), pos from 1719! This entry was posted in Bob Dwyer's Bix & Pieces on November 5, 2013 by Diane.